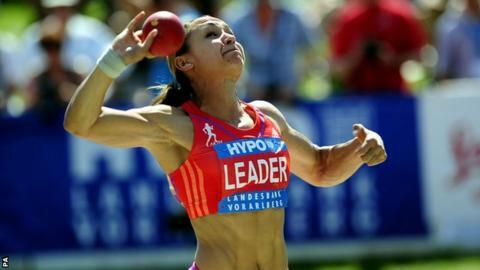 A personal best in the 200m moved Jessica Ennis into the lead after the first day of the heptathlon Hypo Meeting in Gotzis, Austria. It followed a quick time in the 100m hurdles and a shot throw just 16cm short of her outdoor personal best. A disappointing 1.85m in the high jump was the day's only blemish for Ennis. She is more than 200 points clear of a field which includes world champion Tatyana Chernova and Olympic champion Nataliya Dobrynska. Her total of 4,113 is 11 behind her best first-day total from when she won the world title in 2009. The 26-year-old has a lead of 221 points over Austra Skujyte, with Chernova another eight points behind in third. Ennis said: "It's a nice position to be in and I want to have a really good second day now. I just need to come back and do what I know I'm capable of doing in the long jump, javelin and running a good 800m." Her coach Toni Minichiello made a point of counting the hurdles personally after only nine were put out at her last competitive appearance, the Manchester GreatCity Games. Ennis cleared them all in 12.81 seconds, just 0.02secs outside her personal best, to win her heat and take an early lead. But a disappointing effort in the high jump followed - traditionally one of the Sheffield athlete's strongest events. Ennis's first effort in the shot looked close to a personal best but was ruled a foul. Her second attempt of 14.51m was just 16cm down on her outdoor best, but after being unable to improve in the final round she found herself down in second place behind Skujyte. However, then came her brilliant 200m performance, finishing in 22.88secs to take 0.23secs off her previous best as she finished the race in second place and moved back into the lead ahead of Sunday's final events.